Thinking of opening your own place? We’re asking the experts what it takes to succeed in Sydney’s crazy-competitive food industry. Staying ahead of the curve in Sydney’s constantly evolving food scene is difficult. New restaurants, bars and cafes pop up every week, and in Sydney, a city already saturated with food and drink options, it’s incredibly easy for hospitality businesses to fall behind. In partnership with William Blue at Torrens University, we’re asking the hospitality graduates who run our favourite Sydney restaurants to talk about how they got started in the industry. 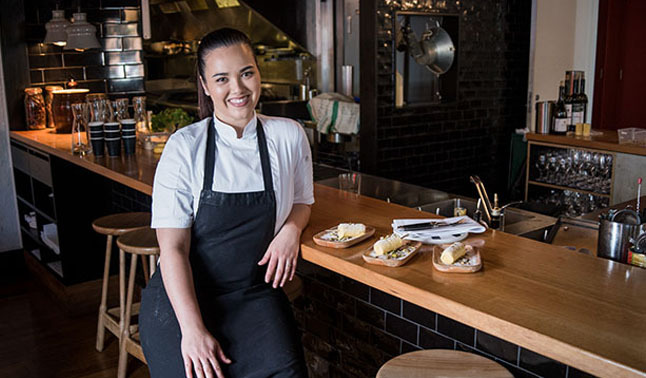 In 2015, Adelene Stahnke helped to open Bang Street Food in Surry Hills with her partner Tapos Singha and designer Nicholas Gurney. In 2016, the same team opened Bang Street Food spin-off Trunk Road in Darlinghurst. Stahnke is only 23 years old, so helping to start up two successful Sydney restaurants is no small feat. We asked her how it all happened, and if she has any tips to share.